My personal Nathan Quick Shot Plus Handheld review. I've been using the Nathan Quick Shot Plus Handheld for a while now and it seems to be standing the test of time. In fact it is my favorite water bottle. Mind you it is not without its faults. * For me the most important thing is that it doesn't leak. And it certainly doesn't, but so long as you screw the cap on correctly and tightly. * Secondly I want it to be comfortable. 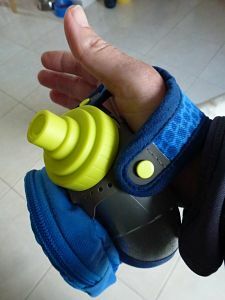 In fact the reason I bought the Nathan Quick Shot plus was because I could slip it on my hand and still have movement in my fingers. You can adjust the velcro strap to fit the size of you hand too. I have small hands and it fits fine. * Thirdly I go for ease of use. 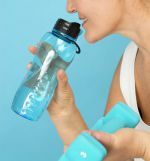 Trying to undo a cap with your teeth whilst running is a pain and then trying to drink whilst water is shooting out the bottle all over the place is even more of a pain. 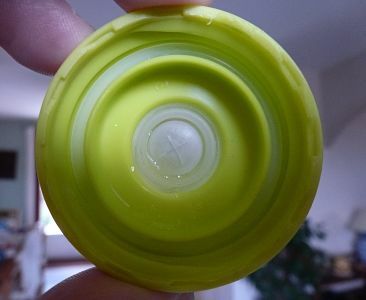 The Nathan Quick Shot has a very clever soft cap with a one way valve (no leakage when turned over) and by sipping on it, the water is drawn into your mouth. Also it is super light and being a pretty "unmuscular" person, I find this so easy to carry. * Fourthly I go for size. I did hesitate a lot before buying this as it is not very big. 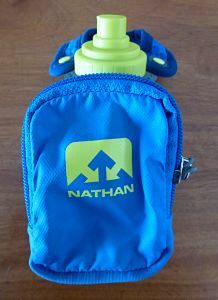 The Nathan blurb says it holds 10 oz or 300 ml of fluid. I reckon that is quite ambitious and I tend to get in around 280 ml. For me it works fine for a run of around an hour. * Fifthly I look at little extras. In the case of the Nathan handheld, it has a dinky little zipped pouch. 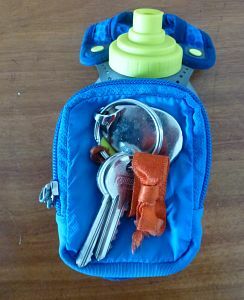 It is not very big and can't hold your mobile phone but is perfect for my car keys, a tissue and a gel bar. I don't think you'd want to put much more in it as otherwise it will start getting a bit heavy. The most annoying thing is not being able to take the bottle out of the cloth casing. If there is a way I've certainly not found it. I've resorted to washing the whole thing under the tap and it does dry pretty quickly but the strap could do with a proper clean which I am unable to do. 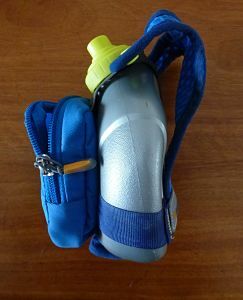 And then what happens if you need to replace the bottle or strap? I guess you can't. Would I recommend the Nathan Quick Shot Plus handheld? I would definitely recommend it if you only want to carry a small amount of liquid and want something light, easy and reliable to use. The quality is very good and I've not had any leaks or problems. I've had mine now for 2 years and it is still going strong.